There is an enormous ballyhoo over unemployment in South Africa – especially among the youth. This is not for no reason. Alarmingly high numbers of people between the ages of 15 and 34 are without work. Demographically, South Africa is also a country with a young profile and hence the need for a focus on employing younger people who have large portions of their working life ahead of them. Skilled Millennials in this age range are also particularly sought after. They have the energy, zeal and often the youthful risk-taking spirit required to make great advances. It is generally untrue that older workers (let’s say, 45 years and over) do not have these abilities. Older workers are often the victims of stereotypes that they lack ambition and the ability to adapt. While this may be true for certain individuals, it is wrong to assume that older workers cannot offer these qualities – and more – to employers. News agency Reuters reports that a survey by Deloitte Consulting showed that 41% of companies around the world considered the aging of their workforces a competitive disadvantage. It is not. Older workers are a competitive advantage companies cannot go without. It’s a simple fact of life that you cannot cram 40 years of experience into 10 or 20. While reading and learning through other people’s mistakes certainly help to shorten the learning process, it is the lived experience that moulds an individual into a well-rounded worker. There is a fundamental reason why job applications place so much emphasis on experience. “Older workers are a valuable commodity and possess industry knowledge that is vital to the sustainability of today’s economy. 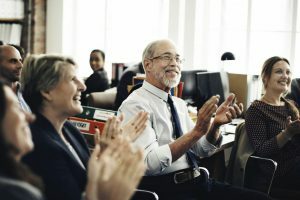 These skilled and versatile trailblazers are competent and committed collaborators who have mastered the art of communicating effectively toward optimizing revenue, results and relationships,” writes Arlene Donovan, a workforce development professional at Forbes. Mark Miller of Reuters also reports that volumes of of research over the past decade has gone a long way toward refuting stereotypes about older workers ─ that they are less productive and energetic, and less able to learn or solve problems. And yet, ageism persists. A 2013 study by North Carolina State University probed the reputation scores of programmers in an online forum called Stack Overflow, which has more than 1,6 million members. They found that, on average, programmer reputation scores increased relative to age well into the 50s. Moreover, they exhibited expertise in more areas than did younger users. The idea behind this compelling evidence is not to discard young talent in favour of older workers. What is required is a multigenerational workforce focusing on what each age group does well. Older workers may not be able to do all the proverbial “heavy-lifting” (such as working insanely long hours and doing physically demanding tasks) anymore, but they could easily be shifted into new roles that are equally valuable to organisational evolution and survival. Employers should think about alternative career routes for older workers, such as more flexible assignments and schedules, creating opportunities for them to mentor younger workers and offering phased retirement. Carol Patton, human resource specialist, says older nurses could thus use their years of experience to mentor, educate and train younger nurses. This will truncate the learning curve and minimise mistakes and build institutional memory – among other benefits. Ultimately, only the most prejudiced employers will ignore the value (and necessity) of older workers. They are a strategic asset to be cherished and prioritised. Workers should be judged solely on the amount of value that they add and not on the amount of years they have lived. Arlene Donovan, 31 October 2017, “Why older workers are a major value added to the workforce”, https://www.forbes.com/sites/forbescoachescouncil/2017/10/31/why-older-workers-are-a-major-value-added-to-the-workforce/#592b58b462dc. Carrol Patton, 25 July 2018, “Why older workers are now in demand”, http://hrexecutive.com/why-older-workers-are-now-in-demand/. Gwen Moran, 29 March 2018, “Why you should recruit older workers”, https://www.fastcompany.com/40547376/why-you-should-recruit-older-workers. Mark Miller, 21 June 2018, “Companies need older workers: here is why”, https://www.reuters.com/article/us-world-work-olderworkers/companies-need-older-workers-here-is-why-idUSKBN1JH15F.